Let's see if my match reports as are rusty as Roger after a 3-month break 😀 . 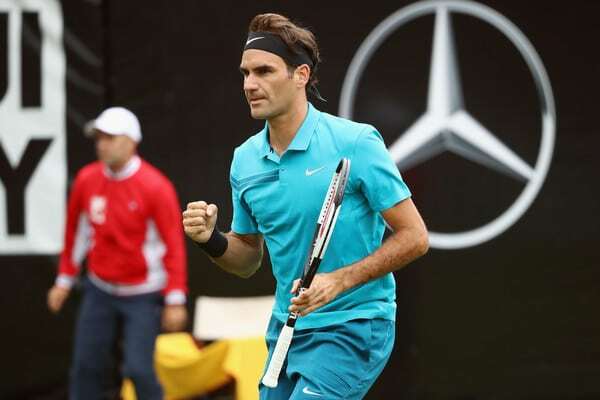 The Swiss certainly showed signs of it having to come from a set down to win his opening match at the Mercedes Cup 3-6, 6-4, 6-2 against Mischa Zverev. The win sees him make a successful return to action having taken a break after the loss in Miami but he's still very much in the reckoning at the top of men's tennis, with a run to the final in Stuttgart ensuring he'll retake the Number 1 ranking from Nadal. Federer won the toss and elected to receive, immediately hitting a nice return en route to fashioning two break points only to see Zverev erase them both. The Swiss then held to 30 and in game five held two more break points but couldn't convert. That proved costly as despite easing through his service games prior, he was broken to love at 3-5 as Zverev found the right shots at just the right time. The German served out the set routinely to take it 6-3. Into set two and a disgruntled Federer had to fend off two break points to hold serve. Clearly a crucial moment in the match and it allowed Roger to up his level as the set got going; eventually breaking for 4-2. That looked like it would be set over but the Swiss failed to consolidate and Zverev soon levelled for 4-4. Fortunately, Roger was able to bounce back quickly, holding for 5-4 and then breaking to love to take things into a decider. With the wind now somewhat in his sails Fed started to find his range in the third, breaking to love for 3-1. And although Zverev had a chance to break back at 2-4 he couldn't take it as Roger broke again to take the third 6-2. Three months is a long time, it's longer than the year-end break. So I'm very happy returning on good terms onto the Tour. It was difficult, missed some chances maybe in the first set… He connected well at the right times. And then I found a way, I found my rhythm… I'm very happy with how I played. I'm super happy to be back on Tour. It's been a great start. Finally, the grass court season is here! Dull weather in Stuttgart but a fun match, a quick court and some slick tennis from both players. Roger started brightly creating four break points but after failing to convert and a small exchange with Lahyani about something that was bothering him he lost focus allowing Zverev to nip in and steal the opener. That was fairly disappointing and when Zverev head break points at the start of the second it looked like another short-stay in Stuttgart but Fed held on, found a little bit extra and eventually finished in style to move into the Quarter Finals. So a good match here that sees Fed hit the ground running and I thought he played well. Some crisp returns, serving a little patchy but the footwork looked precise skipping round some backhands and by the third set he seemed to have the measure of Zverev's hard to read forehand and tricky game style. Coming through a tough early encounter will give him a boost of confidence after Indian Wells and Miami too so job done I think! Predictions coming soon. A surprise opponent here potentially as Prajnesh Gunneswaran shocked Shapovalov in three sets. Good comeback win, serve rusty as expected, poor on break points as expected, bit lucky but found something when required to get over the line. Hey Roger I paid $14.99 less tax to watch you play at least get to the finals. Your the best Roger! Yeah finished with a flourish, return winner, boom! Better than last year already! Welcome back to the grass , and you’ve not lost your touch either Jonathan . Thanks for the quick white up as match not on here . When Fed has his riddum it gives hope! Curious to see Feds next opponent as he was the lucky loser who should have played instead of Trungelletti at RG, now hes beaten Shapo & he’s not well known hope he causes no more upsets! Chum Jetze. Yeah I read he won his maiden title the Indian guy recently, but Pella it is. Good spot! I totally forgot, but thinking about it, maybe it should only be in when he actually does one, it seems to have been consigned to the rubbish bin that shot at least in tour matches. Very concise write up Jonathan and very useful as not televised here,? win!It can be hard work(emotionally)to be a Fed fan. HaHa, Annie, exactly my thoughts on Fedsey’s match, as many times before! Wasting break points, losing sets with no apparent reason, bouncing back and somehow finding a way, throwing in here and there yummy bits of magic. I say: One Fedsey match in an ATP 250 is worth a hundred grunty slugfests on clay, be it majors or other. And you sum up peRFectly Rui, thumbs up! From highlights many of his passing shots seemed damned effective – I trust he’ll do very well and nicely on those fast courts. Ye he started picking Zverev off eventually. Gotta be happy with his performance for a 1st match in months. – mentally reappropriate himself the central court after 2.5 months off. – feel the quality of the grass and how the ball bounced on it in a quite windy environment. – and most of all, cope with an opponent playing serve and volley most of the time. But Fed didn’t panic and won the 2nd set staying as cool as a cucumber. I noticed there were lots of photographers taking pictures during the first set. Maybe he was disturbed by the relentless rattle of cameras ? The next round will be interesting as Shapo is out. Pella is 75th and his Indian opponent 169th. Does anybody know their style of game ? Let’s hope for a sunnier day on Friday. I love the blue shoes and clothes … He looks like a dragonfly, an agile flyer. As for us, we are happy because he is back in his garden and Jonathan is back as well to comment the journey for us. Pella more of a clay courter, got 2 wins under his belt here so should be used to the surface. Nadal made him look like a rank amateur at the French though. Greeting J. Great to have you break. Too early to say anything about his tennis right, sure hell Roger looks fresh, only positive here for me is thta he gets another match before Halle which is nice. Shame on live telecasts here in India. Did a hawk-eye call in the highlights section mention a CPI of 35.1? A grass court with 35.1? Is wimby suppose to be the same. Sounds like a joke to me. Thanks. I didn’t see that Hawkeye CPR data, is that from the highlights I posted? Gosh it’s good to watch these two, looks like actual tennis. Some rustiness as expected, & lack of match play obviously, but really good to see him dial back in & find his range & figure out his opponent. I gather this is the first time Mischa has taken a set off him. #1 on his own racquet again this week, so I hope he makes it to the final. (Ok, yes, #98 would be fabulous too!) Lots of points to defend coming up. I don’t have strong feelings about his clothing sponsor (as long as they give him polos) – though I’ve thought Adidas or Lacoste would be a more natural fit for a long time – but of course nobody knew Fed was going to turn out to be Fed when he first signed with Nike, he was just another talented youngster. On the other hand the large bright red Uniqlo square always bothered me on Nole’s outfits, & that doesn’t honestly seem to me to fit the Fed image either. But they’ve done some nice things for Kei. I guess we’ll see. Yeah, I’d pick Nike comparing their outfits side by side. on the websites. I can’t imagine too many brands can be in the running for the deal though, a lot of them will be priced out of it. Uniqlo probably endless pots of Chinese cash. Sorry Mischa Zvrerev playing in your home country the crowd always favor “The Great One” Roger Federer. It’s disheartening playing Roger in your home country and hearing loader cheers for your opponent. Would not be the case if it were Nadal, I am sure of that. Nadal has a bit of a following, so would be a fair split I think. Fed virtually home player in Germany too, only 2 hours from home. The best atmosphere / support I think was Fed vs Murray at WTF in 2012. The atmosphere was awesome, pro Fed crowd too. Yeah Nike been ever present. Interested to see if he does move what designs they come up with. What happens to the Fed emojis?! The best thing I got from this match is Fed said he was getting bored and is super happy to be back on tour. I’d say he seems to love it more than anyone. He looks happy and fit. 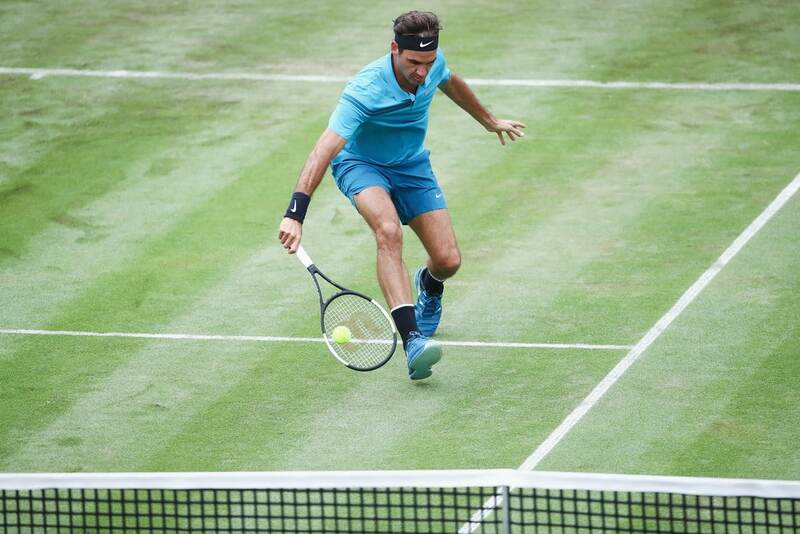 Would be strange to see Roger in anything other than Nike. But, they have strayed into weirdness with some of their designs. That black and pink…are you kidding me. So Roger wants more money than they are offering? Nike doesn’t “own” the RF logo…do they???? Doesn’t sound from what he’s saying as though he’s particularly keen to leave Nike, but whether part of that is because they own the logo I don’t know. Maybe Roger wants the logo. I’m hoping the logo stays with him. I was going to get a RF tattoo. For now I’ll stick with my RF mouse pad. They own it but it’s not like they could use it if he’s no longer got a deal with them. So I’m fairly sure he’d be taking it with him. RF logo on a Uniqlo shirt though. Weird. Yeah, weird. I’m not fond of the “square” Uniqlo logo. I thought Djoker left because they couldn’t afford him anymore? Not like Nike can’t afford Roger with all the Asian sweat shops. Life is suddenly back great again! Whatever he wears, however many times he wastes BPs, however often he gives us heart attack or makes us emotional wreck, it’s far better than being bore to death. When Fed’s on tour, happiness is on air. Excellent recap, thanks Jonathan. Loved the outfit, such a delightful colour! Getting the polo anyone? Enjoyed the highlights, although I could indeed see the rust a little bit. Really like the outfit, though – looks a lot classier than recent versions. Oh yes, Thank God for time being with Jonathan and Roger – missed you both! Thanks for well spirited recap, Jon, here we run about again! Yes, Roger seems happy too, fit and glad and feeling at home courting his brilliant tennis. And, judging from highlights – his backhand makes fantastic winners. – ? Maybe his creative surprise this time? Any rate looking indeed well for real tennis PLAY and genuine fun. Takk, slightly better video quality than the one I posted. Wish there was more HD stuff. Federer will play against the Argentine G. Pel!a not before 3: 00 pm tomorrow (Friday) at Central European time (the schedule has just been given). Go champion ! We’re all with you. Guido Pella is a lefty and rather nice looking.Career high 39.Fed should be okay……? Played at Wimbledon before, close-ish match back then but Fed was on one leg. Didn’t they play at Halle, or am I confusing him with someone else? Welcome back Jonathan! I too thought Fed played pretty well given the break. He looked keen and hungrry to come forward and to pick off his oppo. BH fired well early and he playted sine classy volleys. The 1st serve was not as reliable early on and Mischa read it well out wide on the deuce side which of course goes into his stronger BH. In fact Rog was stubborn at times playing onto the Zverev BH whereas we all know his FH is weaker. That said, that was definitely the best Mischa has played against Rog and he matched him for a set and a half. Funny how ppl were worried about Denis whereas I thought he might lose ( been up and down lately) and was more concerned about Zverev not giving Rog time and rhythm. I am there and agree the court is pretty slick. Pella doesn’t hv the power and is very much a baseliner but he is very quick and won’t go away. Nick was impressive on serve today despite his hip niggles and I still think we will get a Nick/Fed semi. Raonic also looking mighty impressive ( ☹️☹️☹️) and he’s my pick to come thru the other end. Shapo is all hype, I knew as soon as he signed with a mid-tier garbage watch brand like Tag Heuer that you can’t take him seriously. Expected him to win his first match though. Kyrgios seems to be perma-injured, guess he has some funky technique on his shots and a bit ungainly in his posture. Such an important win this one, as if he’d lost he’d love lost three matches in a row. Has that even happened to him in his career since 2000? Mentally it’d have hit his confidence big time no matter how small this tournament is.